If you are looking for a top-rated vacuum cleaner for less than a hundred dollars, we have some great recommendations to save you time and money. Vacuum cleaners have been part of our household tools for sometime now and many manufacturers have built so many designs and products that it can be challenging to match our needs and budget for the best vacuum cleaner. Have a quick read on our review for today to find which one is perfect for your home. Are you looking to buy the best commercial vacuum cleaners under $100? Buying a new vacuum cleaner is not as much fun as buying a new television. Usually people don't want to spend a lot of money on household appliances that are there to do a basic job. Putting an upper limit of $100 on your new vacuum is a good way to make an inexpensive and painless vacuum cleaner purchase. The affordable vacuum cleaners listed today are all under a hundred dollars and are the top rated vacuum cleaners in their category for 2013. That means on Amazon, they have 4-5 stars which shows customers are giving these vacuum cleaners great reviews. This Hoover vacuum cleaner is the top-selling bagless vacuum cleaner on Amazon in 2012 and with good reason. It is lightweight and convenient to use with the bag free operation. Running costs are reduced with the rinse clean filter and permanent HEPA filter, and no disposable paper vacuum bags are needed to run this unit. The consistent strong suction from the Windtunnel technology, and wide nozzle and 13.5" vacuum head path make vacuuming fast and easy in your home. The scuff-less bumper, 27 foot cord and 5 position height adjustment mean vacuuming various flooring types is easy without having to keep plugging in in new locations. One of the least favorite jobs after vacuuming is to wind the power cord up ready for storage. With the 27 foot long retractable cord, this job just takes a second. Hoover have been making upright commercial vacuums for many years and are known for high quality and great customer service and parts when required. This model comes with a two-year limited warranty and has extension wand, crevice tool, upholstery/dusting brush and powered hand tool. The lightweight Dirt Devil breeze vacuum cleaner is a little cheaper than the Hoover, only slightly more basic. Also a top-rated bestseller, this versatile bag-less vacuum will clean your entire house effortlessly with automatic height adjustment for different flooring types with a 13" cleaning path. The 12 amp motor is powerful enough to pick up hidden dirt and pet hairs. The micro-fresh filtration traps dust and allergens while vacuuming. It has a 25 foot power cord for maximum reach without having the keep plugging in at the nearest power outlet. The extension wand, dusting brush and crevice tool the allow you to easily clean furniture and vehicles. This Dirt Devil Upright Vacuum also has a two-year warranty. This Pet Lover Eureka upright vacuum cleaner, has been designed with pet owners in mind. The powerful 12 amp motors has whirlwind cyclonic suction and HEPA charcoal filter traps allergens and dust and removes pet odors. The small powerful Pet Paw turbo power head has a three stage system for removing pet hair effectively and quickly from furniture. The plastic teeth loosen pet hair, a rubber strip grabs it, and the bristles pull it up and away into the vacuum. The Eureka has a 15-inch cleaning path and a long 30-foot power cord, giving a great range of coverage for cleaning. At just over 20 pounds, this vacuum cleaner is heavier than the other two mentioned today. It seems as though this is the best option for pet owners and is a heavy-duty unit for the price. There will be no more questions asked when you get this vacuum cleaner from one of the biggest is the business. This features the wind tunnel and multi-cyclonic technology for that spotless-squeeky-clean floor you always wanted. It comes with an 8 foot hose for maximum reach. One thing that attracts many patrons is the ability to wrap the power cord in just one press of the foot pedal, it will automatically wrap the cord in no time. This can be very convenient considering we all have precious time to manage everyday at home. For just around a hundred dollars, you get quality cleaning like no other. 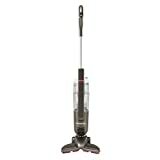 One of top rated vacuums for this value is the pet hard floor vacuum from Bissell. It catches dirt and debris. It features a V shaped intake for maximum coverage of corners, edges, and baseboards. It is lightweight and can be easily carried around the house and for storage. It is also best for cleaning around precious furniture since the special nozzle can easily catch dirt around and under these home fixtures. It is definitely able to clean all those stubborn pet hair that can cause allergies for family members around the house. For this value and just around $50, who wouldn't get this one for the money? 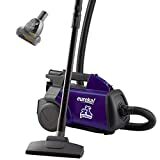 Rated 4 stars by almost 300 customers on Amazon, the Dirt Devil is right on the budget for those who are looking for top rated vacuum cleaners under 100 bucks. It features a lightweight, bagged, upright vacuum cleaner that can be easily maneuvered around the house. Unlike conventional heavy vacuums, you won't even sweat a daily chore using this. It traps almost 99% of dust and allergens with its MicroFresh filtration system. The food cord can reach up to 25 feet for more coverage in the living room or any section of the house for maximum cleaning. What many find very important as its cleaning ability is the headlight which can be convenient on dark areas of the house so you won't miss a spot on your daily cleaning duties. Ready to Shop for your New Vacuum Cleaner? The above reviews give you a great idea of which are the best vacuum cleaners under $100 dollars and what a hundred dollars buys you. Feel free to go through the product images above to search for other deals on vacuum cleaners if you don't see one you like here. Thank you for reading today. Hopefully, these vacuum cleaner reviews have saved you time and money in your vacuum cleaner quest. More best rated vacuum cleaner shopping lists! 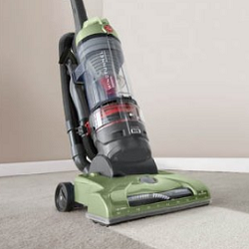 What is the Best Vacuum Cleaner under $200 in 2013? If you have to buy a new vacuum, here is a time saving shortlist of the top rated best vacuums under $200 for pet hair, quiet running & allergies. If you are looking for the best inexpensive vacuum cleaner for the money and have a hundred and fifty dollar budget, we have a great shortlist! Not sure which iRobot Roomba is right for you? This comparison will help you make the right choice.